Kentucky Women in Agriculture Inc. is offering a $1,000 scholarship to women who are full-time students entering their junior year in college. Essay required. Deadline is May 1. For more information or to download the application and guidelines, visit the KWIA website at www.kywomeninag.com or contact info@kywomeninag.com or (877) 266-8823. Two LaRue County High School band students, Jared Helm and Taylor Akin, were named to the All-State Concert Band. Both students also have been named to the UK Honor Band, Asbury Honor Band, All-District Concert Band and All-District Symphonic Band. Both received distinguished ratings at regional solo and ensemble festival. Helm, the son of Tom and Angela Duggins of Buffalo, plays French horn, mellophone and guitar as a participant in marching, concert, jazz, pep band and small brass ensembles. He also assists with the instruction of middle school band participants. Once each year, LaRue County Schools hold a dinner to honor their retirees and those who are retiring. Four people totaling 109 years of service with the district will be recognized at the program at LaRue County Middle School cafeteria April 24. Two elementary teachers, Susan Phelps and Martha Page, total 67 years teaching experience. Both were asked what they would tell a young person considering a career in teaching. Phelps, with 33 years in the profession, said that the prospective teacher must realize that it is not a job, but rather a way of life. Hannah E. Canter has been awarded a $12,000 four-year Fraternal College Scholarship in a national competition with other students who are members of Modern Woodmen of America. Canter, the daughter of Gary and D.J. Canter, Hodgenville, plans to use the scholarship to attend the University of Kentucky. LaRue County school students in grades 3-8, 10 and 11 will start taking the Kentucky Core Content Tests on Monday. Although Senate Bill 1 made sweeping changes to CATS, it will be three years before the new system is in place. In addition to the three R’s, Peggy Newton, LaRue County School District’s 2009 ExCEL Award winner, also teaches the three L’s – look, listen, and learn. Western Kentucky University civil engineering students won several first-place awards during the American Society of Civil Engineers, Ohio Valley Student Conference. WKU concrete canoe team members include Jacob Riggs of Upton. In the concrete canoe competition, WKU placed third in overall performance, second in design paper, second in final product, first in men’s slalom/endurance race, first in women’s slalom/endurance race, first in men’s sprint race, first in women’s sprint race and first in co-ed sprint race. Though Mike Brown, LaRue County director of pupil personnel and safe schools coordinator, can’t foretell when the next emergency will arise in any of the district’s four schools, nor what type it will be, he is doing his best to see that all sites are thoroughly prepared to meet it head-on. Part of this preparation is a well-thought-out emergency response plan made with the cooperation of local first responders and law enforcement officials. Three members of the LaRue County Band of Hawks participated in the University of Kentucky Honor Band in Lexington on Feb. 20-22. These students were chosen among students around the region. 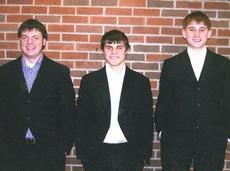 The students who attended were: Jared Helm (horn), Drew Tucker (horn) and Taylor Akin (euphonium). In the fall, Helm will attend the University of Kentucky. Tucker and Akin will attend Western Kentucky University. All three students will continue their musical talents as they pursue a degree in music education. Students in Becky Hawkins’ class at Hodgenville Elementary School have been working on a new project – a newspaper called Hawk Talk News. The students made story selection, wrote, edited and took photos to accompany the stories.